Four Sun Conures, a parrot species from northeastern South America, recently arrived at the Delaware Museum of Natural History, becoming the newest additions to the Museum’s live animal collection and engaging with visitors at scheduled times. The Museum’s live animals teach visitors about animals and nature in an interactive and engaging way. 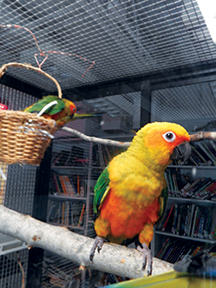 The conures were hatched at Animal Behavior and Conservation Connections. The organization also hosts free bird flight shows during special events at the Delaware Museum of Natural History. The International Union for Conservation of Nature (IUCN) classifies wild Sun Conures as endangered and the U.S. Fish and Wildlife Service regulates the number of Sun Conures entering the country to help protect their numbers in the wild. Despite this status, these striking yellow and green birds remain popular pets. 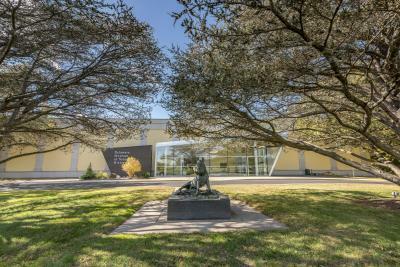 Perrotto hopes having the birds at the museum will educate visitors about responsible pet choices. “Sun conures aren’t great pets, unless you really like birds,” says Perrotto. The birds’ 30-plus year life span, noisy vocalizations and potentially destructive chewing habits could prove too much for many people to handle and bond with their caregiver for life, she says. For those who do choose birds like conures as pets, finding a reputable breeder is imperative. The Museum’s conures are still juveniles, having only hatched about a year ago. Perrotto says, “They are still like kids who have to learn how to share.” Besides adjusting to their new home at DMNH, they are learning how to interact with each other, museum animal care staff, and visitors. To learn more about the Delaware Museum of Natural History and how you can visit the Sun Conures please visit the museum&apos;s website, delmnh.org or request a free visitors guide to plan your trip to Wilmington & the Brandywine Valley.